BACKGROUND: The educational environment has been confirmed as crucial factor for active learning. Team-based learning (TBL) is an interactive teaching method which improves students' perceptions and performance. METHODS: A quasi-experimental study was conducted among 23 public health students of bachelor degree and 14 public health students of associate degree to teach communication and Health Education in Qom University of Medical Sciences from January 2015 to Jun 2016. Students of bachelor degree selected TBL and students of associate degree preferred the traditional lecture-based method. In the current study, educational outcomes were defined as educational environment and academic performance. At the last session of the semester, the educational environment and academic performance of both groups were evaluated. Data were analyzed by SPSS version 20.0 using Chi-square and Mann–Whitney test. RESULTS: The mean and standard deviation of individual test score between the two groups showed significant difference based on Mann–Whitney results (P = 0.036). The mean of final examination score in TBL group was significantly higher than the traditional lecture group (P < 0.021, Mann–Whitney). Our findings showed that in TBL group, 78.3% of students' perceptions were in very favorable condition while it was only 28.6% for students of the traditional method. CONCLUSIONS: TBL method improves students' perceptions about each area of educational atmosphere and also provides opportunities to innovate which lead to active teamwork among learners, and it can effectively enhance students' academic performance. In fact, the educational environment is determined as anything that occurs in the class, college, or university and is one of the most important determinants of behavior in medical universities. Furthermore, learning environment is the illustration of the training program and often it is defined as the demonstration of the effect of different parts of the educational program on students. Educational environment provides a comprehensive, systematic, and detailed depiction of the education process, considering a method for analyzing the nature of educational activities. Actually, students' perception of the environment, quality, curriculum, and curricular changes shows educational climate. Researchers believe that educational environment and educational climate are interchangeability. These researchers have mentioned the importance of measuring educational environment as a key indicator of learning in classrooms. Moreover, evidence shows a significant relationship between educational climate and academic achievement. The educational environment is one of the most important factors which reflects the quality of higher education. The quality of educational environment is changeable and various factors affect the educational environment in the classroom. These factors can determine the quality of education in a classroom or educational institution. Among these, the instructor should be considered as the human factor. In addition to a comprehensive focus on all components affecting teaching and learning activities, the instructor must particularly concentrate on his teaching method. Hence, educational experts and professionals regard new teaching methods as one of the most important criteria for an influential instructor. In many courses such as public health, students should be prepared to communicate effectively with clients in health-care system. This skill can be achieved through an active learning classroom. However, despite the developments in medical education, it seems that faculties do not use new teaching methods. In recent years, to promote learning quality and to improve educational environment, there is an essential need for faculties to apply student-based method such as team-based learning (TBL) in the classrooms. TBL, which was developed over 20 years by Dr. Larry Michaelsen, is an effective teaching strategy to improve learning outcome in various field of the study including medical students., In fact, TBL is designed through active learning strategy and is learner-centered but instructor-led. This method focuses on interactive of participating in small group discussion to answer questions and to solve problem., TBL method increases students' skills to achieve higher level of cognitive learning using interactive learning. In addition, it is a cost-effective method and can be applied to multiple topics. Through the work of application in TBL, students can exercise in a safe environment and the similar problem-solving situation that they will require to exercise as public health practitioner. The goal of TBL method is promotion of students' skills in achieving higher levels of cognitive learning using collaborative learning. First of all, preparation which learners should study the course content before the class. Second, readiness assurance using individual and group readiness assurance tests (RATs) as well as, in this stage, discussion with the professor and classmates are performed. In the last stage, deep learning by organizing small groups and group activities is done. Learners apply course concepts to problem-solving works designed by faculty and analyzed by teams. This interaction with peers and faculty cause to consolidate learning. In recent years, interest in the attitudes regarding to the educational environment at medical universities has increased. Accordingly, previous studies support the positive effect of TBL method on faculty satisfaction,,,, increased student preparation and communication skills,,, improved students' engagement, and increased problem-solving skills., As before cited, public health students need to learn how they communicate with clients. Active learning in TBL classes motivates them to engage in healthy communication in the future. To the best of our knowledge, however, there are no published studies using TBL in undergraduate public health students and its impact on educational environment. The comparison of the team-based learning method with lecture-based approach on educational outcomes in public health students. This quasi-experimental study was conducted in Qom University of Medical Sciences (QUMS), in Central Iran. The university has six vice-chancellors, four schools (medical sciences, health, para-medical, nursing and midwifery, and other academic group such as Islamic knowledge group and general training group), five teaching and treatment centers, seven hospitals, and several health centers, which educates students in almost all medical fields. Thirty-seven second-year public health students were enrolled in the communication and health education course (January 2015 to June 2016). The aim of the study was presented by the platform at the meeting of public health department. Students divided into two groups, the first group was bachelor degree and the second group was bachelor degree after passing an associate's degree. Both groups had usually identical lesson plans in this course. In the first session of the class, students of both groups were informed about the issue and hence they voluntarily selected either the teaching method or traditional one. Students of bachelor's degree in public health selected TBL (n = 23) and students of associate's degree preferred the conventional lecture-based approach (n = 14). First, pretest including all course topics was performed on both groups to assess their knowledge about course, considering 20 as the maximum. In the next stage, the tasks of students and the selected method were accurately explained in both groups. After conducting the TBL method, we assessed educational environment and academic performance as a measurement for evaluation of educational outcomes. Students were divided into four teams and then based on their attendance list; each student was placed into a team. Students were given a preparatory handout for their home study, 1 week before each TBL class. At the beginning of each TBL class, an individual RAT (IRAT) in 10–20 multiple-choice questions were designated to check students' preparation level and students were asked to individually answer them in 8–10 min. After the group discussion, group RAT was taken which had the same questions as the IRAT. In fact, the members of each team discussed on questions and selected an answer which was agreed on in the team. After 15 min, every question was read for all TBL team and the teams answer to each question and the result was mentioned in a team answer sheet. Afterward, students discussed on the reasons for why each answer was correct or incorrect within 20 min. Hence, there was an interactive environment in the class. Following, faculty designed a scenario related to the practical situation; the students were given group assignment projects (GAPs), which involved clinical practical questions to evaluate the students' ability to apply their learning to difficult clinical situations. Then, each team presented its GAP findings to the class and a peer evaluation was done by students and score were given to each team. Finally, 30 min was devoted to an explanation of uncovered parts, questions of students were answered and conclusions were achieved. Furthermore, to better exploration the experience of students regarding educational environment, we conducted three focus group discussions after completing sessions. Focus groups were facilitated by a skilled moderator (corresponding author) based on organized discussions and an interview guideline form. Each session was lasted about 2–3 h. Focus group is defined as a technique to gain a deep insight about participant's experiences. An interview guide was developed and applied to conduct the interview. Focus groups were audiotaped, and also after each focus group, debriefing notes, which were consist of the focus group process, remarkable data, direct quotes, and nonverbal communication such as gestures and behavior, were made by moderator and observer. Actually, the observer was Master of Sciences student of health education who attended in all focus groups and contributed with moderator to make debriefing notes. Finally, we categorized all data according to differences and similarities in two separated parts: positive and negative points. At the end of each session, only individual examination was taken based on the same questions in TBL group. At the last session of the semester, the educational environment of both groups was measured by a Dundee Ready Educational Environment Measure (DREEM) questionnaire. Students completed a demographic questionnaire asking information about their gender, marital status, residence status, and employment status. The DREEM questionnaire includes of 50 items, each scored 0–4 on a 5-point Likert scale (4 = strongly agree, 3 = agree, 2 = unsure, 1 = disagree, and 0 = strongly disagree). There are nine negative items (include numbers 4, 8, 9, 17, 25, 35, 39, 48, and that scored in reverse manner. The highest score for the overall DREEM is 200. DREEM questionnaire contains 5 subscales: students' perception of learning (SPL, 12 questions with a maximum score of 48), students' perception of teachers (SPT, 11 questions with a maximum score of 44), students' social self-perception (SSP, 7 questions with a maximum score of 28) students' academic self-perception (SAP, 8 questions with a maximum score of 32), and students' perception of atmosphere (SPA, 12 questions with a maximum score of 48) [Appendix 1] [Additional file 1]. Interpretation of total score is classified in four groups of very poor (0–50 points), plenty of problems (51–100 points), more positive than negative (101–150 points), and excellent (151–200 points) [Appendix 2] [Additional file 2]. Interview guide form was comprised three questions: (a) What is your experience about learning activities throughout TBL method? (b) What effect did TBL have on educational environment for interactive in-class learning? (c) What are the most positive and negative points of TBL method? The data were analyzed using SPSS 20.0 software and the significant level was assumed as 0.05. We used descriptive statistics to descript the collected data and also Chi-square test was used to compare the difference of demographic characteristics between both groups. The pretest, IRAT, and final examination scores were compared in both groups using Man–Whitney test. We conducted semi-structured interviews with all lecture group students immediately after the end of the semester through holding three focus group sessions. We listened to the tape and then transcribed the content of the tape. In the next stage, we checked the content of the tape with the debriefing notes. The methods used to categories focus group data were adapted from approaches to qualitative content analysis developed by Graneheim and Lundman. The Research Ethics Committee at Deputy of Research of the QUMS had approved the study protocol and had monitored the research process. Further, the participants had been given the participant information statement and had signed the written consent form. Individual personal information was kept confidential. Sociodemographic characteristics of the students at baseline are presented in [Table 1]. The mean and standard deviation of students;' age in TBL and traditional teaching methods were 20.37 ± 2.18 and 24.43 ± 4.45 years, respectively. Most of the students in TBL group were single (73.9%) and nonresidential (78.3%) and unemployed (100%). Hence, distributions of age, marital, residence, and employment status were significantly different between the TBL and the traditional teaching groups. Chi-square test showed that there were the significant differences between two groups in all sociodemographic characteristics (P > 0.05). According to literature, course/curriculum, individual teachers, supervisors, and facilitators affected the educational environment. We did not found any evidence concluded that gender, marital, residential, and employment status affect the student's perception about educational environments. Therefore, because of the limitation of choosing the students and classes and limitation due to some educational rules, we could not perform random allocation into two groups. However, this homogeneity did not affect the students' perception of educational environment. Therefore, we were satisfied with choosing current groups. There was a significant difference between total score of students' perception of educational environment in TBL and traditional teaching methods (P = 0.029) [Table 2]. The study showed that 78.3% of students had an excellent view of TBL method, while it was only 28.6% for students of the traditional method. Details of class status in each area are presented in [Table 3]. The qualitative analysis led to emerge negative and positive point from focus group data. Overall, from the students' point of view, we concluded that it was too interactive for students and too difficult for instructors to motivate and control students in TBL method. In addition, teamwork and communication skills were interested. 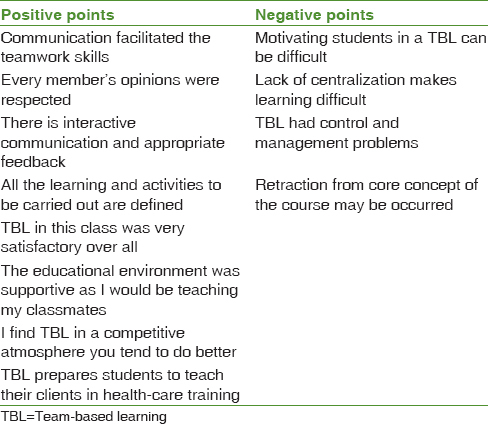 Some negative and positive point of TBL method has been reported in [Table 4]. According to the finding, there was no significant difference between the mean score of pretest in TBL group and traditional method group (11.01 ± 3.07 vs. 11.75 ± 3.12; P ≤ 0.05). The mean and standard deviation individual RAT score in TBL and traditional teaching methods were 17.29 ± 2.74 and 16.81 ± 3.45, respectively, and there was a significant difference between them based on Mann–Whitney test results (P = 0.031). Mann–Whitney test also showed a significant difference (P = 0.011) between the mean for the final examination scores of TBL and traditional teaching methods 18.06 ± 2.37 vs. 17.12 ± 3.48, respectively. Our findings demonstrated that in which TBL method was applied, students provided a more positive perception of educational environment and also showed improved performance on their final examinations and individual RAT than the traditional lecture group. In fact, TBL method motivated student to go beyond faculty information and also allowed instructor to see which concepts were not well understood also gaps and deficiencies of learning was improved as group worked together. 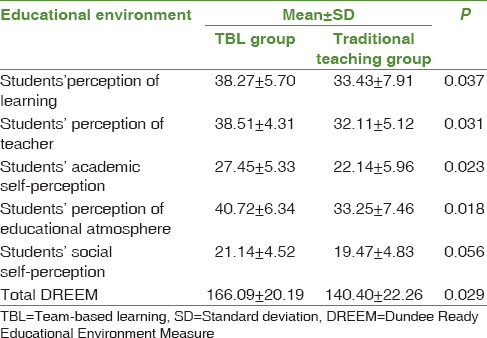 In TBL group, with the exception of students' social self-perceptions, all areas of educational environment, including students' perception of learning, students' perception of teacher, students' academic self-perceptions, and students' perception of atmosphere were better and more efficient (mean = 166.09, standard deviation = 20.19) than traditional teaching group. However, there was no significant difference between students' social self-perception in TBL and traditional lecture group (P = 0.056). The questions of SSP is related to the social environment overly. Accordingly, TBL method focuses on the educational social environment, while the questions comprise a more area social environments. According to findings, 78.3% of students had an excellent view of TBL method while it was just 28.6% for students learned in the traditional method. Based on our result, there was significant difference between student's perceptions of learning and educational atmosphere in both groups (P ≤ 0.05) might be due to TBL method facilities learning process and lead to active and deep learning and also it can promote communication skills. This finding was in agreement with a study has been conducted by and Hassanzadeh et al. Furthermore, significant difference was found between students' perceptions of teacher in both the groups (P = 0.031). The possible explanations for this difference could be due to, in TBL group, faculty devoted the part of class time to describe uncovered content. Accordingly, students understood intended content of that session and gaps and deficiencies of learning was reformed. Moreover, students' academic self-perception ability between both groups showed significant difference, probably due to TBL result in motivating students to go beyond class information and also in TBL group, students had a preparatory handout for their home study, 1 week before each TBL class. Therefore, they were present with preparation in the class. The mean score of social condition subscale in traditional lecture group was slightly less than those in TBL group, provided a marginally nonsignificant differences (19.47 vs. 21.14, P = 0.056). First, most of the students (n = 12, 85.7%) in traditional education method were employed in health-care setting at the time of the study. Health-care systems inherently make a strong social relationship between health-care professional and clients. Since engaging with clients in health-care delivery system may be lead to improve their social relationship, students in traditional lecture group perceived a good social condition. Second, 78.6 of the students in traditional education method were married. Hence, they may have more social interactions with other. Third, some items in social condition subscale evaluate the quality of students' social life rather than social environment in class. Previous studies,, are available that support our hypotheses, suggesting that TBL has positive effect on student's performance and deep learning, probably due to promotion of personal knowledge by interaction with peers and faculty and also providing opportunities to innovate and incentive for student's participation. Moreover, TBL needs advance preparation to which students have responded interactively, and this approach resulted in the increase of examination performance. In addition, in previous studies, TBL methods have improved perception about educational practices and success in the key examination in student who was studying in rehabilitation sciences,, midwifery, and medical education sciences. Advantages of TBL than traditional lecture method for dental clinical education were also demonstrated by previous studies.,, According to Cheng et al., TBL method may improve learner-to-learner interaction, resulted in active teamwork in students. Furthermore, studies showed that TBL method positively has affected on perception about learning in medical and nursing students. Our results in the students' perception of educational atmosphere subscale were according to Paul's study that indicated TBL was a more active approach in learning on medical student of Boonshoft School of Medicine than the traditional methods. Past studies focused on the effect of learning and academic performance, while this study evaluated additional outcomes beyond learning (i.e., educational environment). Setting an appropriate control group is a crucial important issue to assess the effectiveness of the different class formats. In this study, we evaluated scores of the lecture group test as the control data. Some of the free comments from the students documented that studying in a TBL can be difficult. Hence, it could be said that active learning in TBL requires a good and adequate management skills. However, supportive and interactive educational atmosphere develop a competitive environment in the class. TBL is different from traditional educational approaches and also seems to have more chance for learning individual. As another studies, our study has weak points. First, the sample size was limited; resulting limited the statistical power and preventing statistically significant findings. Furthermore, group selection was not voluntary and also both groups were heterogeneous, in the other word, there was a remarkable difference between the numbers of students in both groups. Second, many factors might have affected the students' test scores. Third, this study discontinued for a long time to improve attitudes toward the health education in medical and health centers. Further study is needed to determine if improves in attitudes in a long term. The present study was conducted to compare TBL approach with traditional lecture method to teach health education and communication in public health students. According to our findings, it seems in the TBL method, students' perception about each area of educational environment is better than traditional teaching methods. In summary, TBL method is a relatively new educational strategy that provides opportunities to learn from each other. TBL method also facilities educator's ability for teaching and consequently develops teamwork among learners. However, TBL method is highly effective valid formats for health education classes, but it requires a good management skill. The authors would like to thank students for participating in the study and the Department of Public Health of the QUMS to facilitate conducting the study. The authors also like to thanks Students Research Committee, Kermanshah University of Medical Sciences, Kermanshah, Iran. (Registration Number: 96101). This study supported by Kermanshah University of Medical Sciences. (Registration Number: 96101). Al Sheikh MH. Educational environment measurement, how is it affected by educational strategy in a Saudi medical school? A multivariate analysis. J Taibah Univ Med Sci 2014;9:115-22. Schönrock-Adema J, Bouwkamp-Timmer T, van Hell EA, Cohen-Schotanus J. Key elements in assessing the educational environment: Where is the theory? Adv Health Sci Educ Theory Pract 2012;17:727-42. Genn JM. AMEE medical education guide no 23 (Part 1): Curriculum, environment, climate, quality and change in medical education-a unifying perspective. Med Teach 2001;23:337-44. Makhdoom NM. Assessment of the quality of educational climate during undergraduate clinical teaching years in the college of medicine, Taibah University. J Taibah Univ Med Sci 2009;4:42-52. Zawawi AH, Elzubeir M. Using DREEM to compare graduating students' perceptions of learning environments at medical schools adopting contrasting educational strategies. Med Teach 2012;34 Suppl 1:S25-31. Cerón MC, Garbarini AI, Parro JF. Comparison of the perception of the educational atmosphere by nursing students in a Chilean University. Nurse Educ Today 2016;36:452-6. Aghamolaei T, Fazel I. Medical students' perceptions of the educational environment at an Iranian Medical Sciences University. BMC Med Educ 2010;10:87. Hamid B, Faroukh A, Mohammadhosein B. Nursing students' perceptions of their educational environment based on DREEM model in an Iranian university. Malays J Med Sci 2013;20:56-63. Rajati F, Kamali K, Parvizy S. Public health customers' experiences of health accessibility: A phenomenological study. Iran J Epidemiol 2011;7:17-24. Hassanzadeh G, Abolhasani F, Mirzazadeh A, Alizadeh M. Team-based learning a new strategy in integrated medical curriculum: The experience of school of medicine, Tehran University of Medical Sciences. Iran J Med Educ 2013;13:601-10. Kim HR, Song Y, Lindquist R, Kang HY. Effects of team-based learning on problem-solving, knowledge and clinical performance of Korean nursing students. Nurse Educ Today 2016;38:115-8. Nieder GL, Parmelee DX, Stolfi A, Hudes PD. Team-based learning in a medical gross anatomy and embryology course. Clin Anat 2005;18:56-63. Michaelson L, Peterson T, Sweet M. Building learning teams: The key to harnessing the power of small groups in management education. The SAGE Handbook of Management Learning, Education and Development. (Eds. In S. J. Armstrong and C. V. Fukami; 2009. p. 325-43. Cheng CY, Liou SR, Tsai HM, Chang CH. The effects of team-based learning on learning behaviors in the maternal-child nursing course. Nurse Educ Today 2014;34:25-30. Corbridge SJ, Corbridge T, Tiffen J, Carlucci M. Implementing team-based learning in a nurse practitioner curriculum. Nurse Educ 2013;38:202-5. Mody SK, Kiley J, Gawron L, Garcia P, Hammond C. Team-based learning: A novel approach to medical student education in family planning. Contraception 2013;88:239-42. Miles S, Leinster SJ. Medical students' perceptions of their educational environment: Expected versus actual perceptions. Med Educ 2007;41:265-72. Chung EK, Rhee JA, Baik YH. The effect of team-based learning in medical ethics education. Med Teach 2009;31:1013-7. Clark MC, Nguyen HT, Bray C, Levine RE. Team-based learning in an undergraduate nursing course. J Nurs Educ 2008;47:111-7. Conway SE, Johnson JL, Ripley TL. Integration of team-based learning strategies into a cardiovascular module. Am J Pharm Educ 2010;74:35. Zgheib NK, Simaan JA, Sabra R. Using team-based learning to teach pharmacology to second year medical students improves student performance. Med Teach 2010;32:130-5. Dana SW. Implementing team-based learning in an introduction to law course. J Legal Stud Educ 2007;24:59. Michaelsen LK, Sweet M. The essential elements of team-based learning. New Dir Teach Learn 2008;2008:7-27. McInerney MJ, Fink LD. Team-based learning enhances long-term retention and critical thinking in an undergraduate microbial physiology course. Microbiol Educ 2003;4:3-12. Hutchinson L. Educational environment. BMJ 2003;326:810-2. Koles PG, Stolfi A, Borges NJ, Nelson S, Parmelee DX. The impact of team-based learning on medical students' academic performance. Acad Med 2010;85:1739-45. Wiener H, Plass H, Marz R. Team-based learning in intensive course format for first-year medical students. Croat Med J 2009;50:69-76. Takeuchi H, Omoto K, Okura K, Tajima T, Suzuki Y, Hosoki M, et al. Effects of team-based learning on fixed prosthodontic education in a Japanese school of dentistry. J Dent Educ 2015;79:417-23. Jafari Z. Comparison of rehabilitation students' learning in neurology through lecture with team-based learning (TBL). Iran J Med Educ 2013;13:448-56. Rastegar T, Hoshyari Manesh S, Salari H. Effect of Team based learning on rehabilitation students anatomy learning. JIUMS 2016;23:163-8. Feizi A. A study on the midwifery student's perception of the children's care course by using team-based learning in coparison with conventional learning. J Urmia Nurs Midwifery Fac 2015;13:525-34. Haj-Ali R, Al Quran F. Team-based learning in a preclinical removable denture prosthesis module in a United Arab Emirates dental school. J Dent Educ 2013;77:351-7. Kumar V, Gadbury-Amyot CC. A case-based and team-based learning model in oral and maxillofacial radiology. J Dent Educ 2012;76:330-7. Pileggi R, O'Neill PN. Team-based learning using an audience response system: An innovative method of teaching diagnosis to undergraduate dental students. J Dent Educ 2008;72:1182-8.